Historic town: Begur has had an interesting and varied past, with evidence of the ages of all the communities that have lived here. Within the old town itself there are watchtowers, grand houses and a medieval castle. Hiking trails: Begur holidays are based in a stunning location, near swathes of green countryside and a dramatic cliff-faced coastline. This makes it a dream for hikers as there are several well-worn paths that lead to sandy, quiet coves. There are also two trails which follow steep inclines for a more difficult but rewarding ramble. Begur Castle: Built atop the highest hill in Begur, this castle actually dates back to the 11th century but was damaged twice during wars with French armies from the north. It still has a rather worn look now, with exposed brickwork and weathered stone walls, but that’s to be expected over the course of almost 1,000 years! 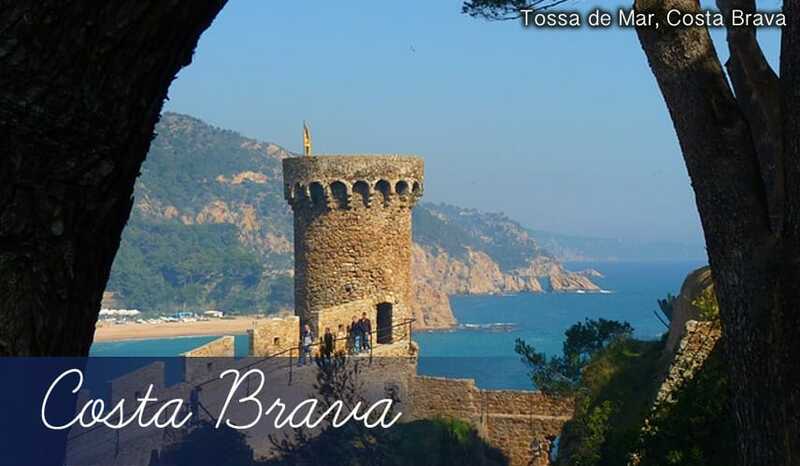 Pay the castle a visit on your holidays here and you’ll be rewarded with some spectacular views of Begur and the coastline of Costa Brava. Watchtowers: There are four 16th century watchtowers in Begur: Can Marques, Sant Ramon, Hermanac de Can Pi and Pella i Forgas. They highlight how much Begur was attacked by pirates and invaders in the past. A royal licence was actually issued to warrant the building of several towers, and one street in particular was even named ‘the street of towers’. Grand Houses: Begur was the town of choice for the ‘Americas’ – Spanish people who left the country to make their fortune in South America. They returned as wealthy men and spent some of their money building grand houses and palaces in Begur. Their extravagance is still there for all to see on holidays to Begur today, with nearly twenty grand houses dotted around the town. Hiking trails: On walking holidays to Begur you can follow the well-trodden paths which have been used by the locals for years. The main ones connect Sa Tuna beach with Begur and adjoin the Fornells crossroads with the Port d’Esclanya cove. Coastal paths: Originally created as a means to catch smugglers and regulate imports from the seas, the coastal paths of Begur are now used for much more sedate purposes. These paths directly follow the coastline right up to the water’s edge and afford some amazingly scenic views of Costa Brava’s famous rugged mountains. Sa Riera: At 2.2km long and 70m wide, Platja Gran is one of the biggest beaches in Costa Brava. The sand is soft and golden and leads into gently sloping clear water. Being such a popular beach, it caters well to tourists on holidays in Begur as there are over 20 showers, clean toilets and lifeguards on duty. Cala Sa Conca: Much smaller and quieter than Platja Gran, this beach offers a slice of tranquillity on holidays to Begur. It’s very picturesque too, as the rocky headlands enclosing the cove are covered in pine trees and green shrubs. Cala Rovira: Perhaps the most beautiful beach in Begur. Cala Rovira is only 200m in length but it has wonderful views of the densely forested mountains in distance. The water stays shallow quite far out to sea so it’s safe for children swimming in family holidays too. Rostei: Situated within the pretty old town centre in Begur, this seafood restaurant serves delicious dishes made with very fresh ingredients. The food is of a creative vein and presented very artistically on the plate. The fascinating menu includes such delights as strawberry salad, stuffed clams and grilled monkfish. It’s a real culinary highlight on holidays to Begur. Aiguaclara: This boutique design hotel in Begur also has an excellent restaurant open to the general public. The food matches the decor perfectly – rustic yet creative, traditional yet quirky. Try the gazpacho (Spanish cold tomato soup), or the creamy mushroom pastry to appreciate dishes that are bursting with flavour. Pizzeria Pizzeta: You can’t go wrong with a nice pizza, and this Italian restaurant has plenty of them to choose from! Based in a historic Cuban-style house in the town centre, there’s a pleasant terraced area with leafy trees and shaded parasols over tables. The unfussy menu makes it easy to pick out food that children on family holidays will like, whilst also offering inventive dishes like Tuna Carpaccio, Pumpkin Ravioli and Monkfish Kebab. Spanish bars: Begur holidays have a rather traditional character, so fittingly most of the bars are authentically Spanish too. Don’t be put off by the Spanish signs or drinks menus, the local people are very friendly and you’ll see how they like to enjoy their evenings! Some of the best places to try a few tipples are Bar Es Castell, El Mirador and Jovi. The nightlife is not mad or manic, but then that’s just how the people who come here for holidays like it! Weekly markets: There are a few original shops in Begur, but holidays here are not particularly known for full-on retail therapy. There’s a lively and vibrant fresh produce market held every Wednesday, which may be worth a visit to pick up some juicy fruit to take to the beach. Instead, you may find the weekly Thursday market of more interest as there are many different stalls selling craft ware, ceramics and handmade jewellery.